Rainy days getting to you? you just have to use. You are going to delete every layer of this template except her word-art. For the word-art your going to hide it for now, all three parts of it. You will see why in the end. Open TW-OhBugOf- Paper8, re-size it to 700x700, copy and paste under your word art. From there there choose any mask you want or preferably choose circular pattern or the one I have listed as my supplies above. Copy and paste it into your canvas on top of your mask layer, your going to simulate a grassy field pretty much. Now open TW-OhBugOf-Tree re-size it to 80%, copy and paste it into your canvas on top of TW-OhBugOf-Grass Mound2, duplicate TW-OhBugOf-Tree re-size each tree down by 70%-60%, making the trees look not so similar in shape, this gives your signature a outdoor feel, if you catch my drift. Then add your drop shadow to each tree. Open TW-OhBugOf-Starlight2 and TW-OhBugOf-Starlight1 re-size to 80%, copy and paste it into your TW-OhBugOf-Tree's, move to wherever you want your TW-OhBugOf-Starlight2 and TW-OhBugOf-Starlight1 at. Now open TW-OhBugOf-Bug13 re-size it to 40%,copy and paste and place into canvas across your TW-OhBugOf-Tree's. Copy and paste it in front of your fences, making a grassier field in front of your fence. Here your going to add a few flowers and mushrooms to lighten up your grassy field area. Let's open TW-OhBugOf- Flower1, TW-OhBugOf- Flower2, TW-OhBugOf- Flower4, re-size all these flowers to 30%, and TW-OhBugOf- Toad stools3 re-size it to 40%,copy and paste and place them around and under your grassy fields, like planting your garden. Open TW-OhBugOf- Bug12, re-size to 30%, copy and paste and place your little bug wherever you like. Open TW-OhBugOf- Bucket, re-size to 30%, copy and paste and place it to the left side of your tag. Feel free to add TW-OhBugOf- Bubbles re-sized at 30%, copy and paste it into your bucket. 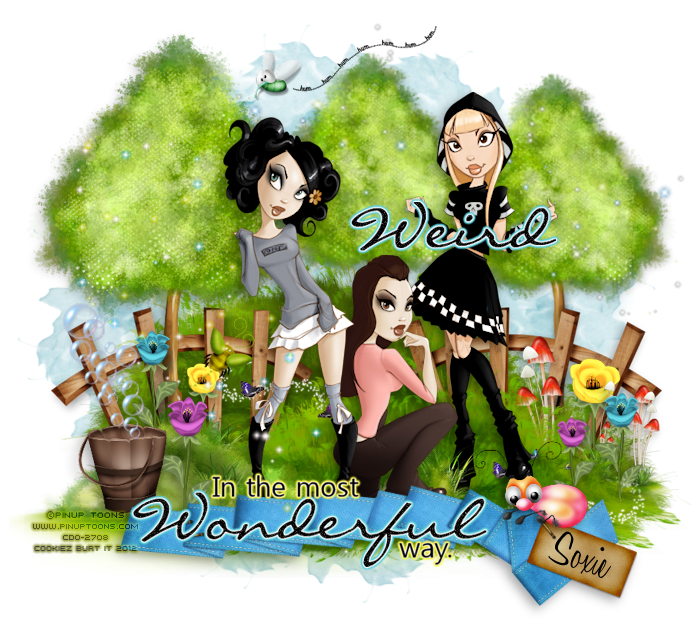 Now here is where you want to add your tubes, i choose Pinuptoons that were purchased at Creative Design Outlet, if you should choose to use the same please make sure you have purchased them along with your license, and add your drop shadows. Open TW-OhBugOf- Folded Ribbon2 or whichever color ribbon you want, re-size to 80%, copy and paste and place in front of your tubes. Open TW-OhBugOf- Bug21 re-size him to 25%, copy and paste and place in front of your TW-OhBugOf- Folded Ribbon2 on the right side on top and above the name tag, and add your drop shadows. Now remember the word-art I told you to hide in the beginning, now is the time to open it, here you will be doing this, adding your gradient glows to the word-art, if you wish. Use Thin gradient, choose any color you wish, or choose white. This will help your word art pop and add your drop shadows. Now here you can add your name on the name tag just like i have mine. You can do the same or be different. But please remember to place your copyrights of your tube and your license.